Getting TOGAF certified proves you’re at the top of the enterprise architecture field. It helps you learn and demonstrate a full understanding of the reasons behind every element of its structure. It also gives you the ability to develop and re-organise your business architecture to fix its shortcomings. As great as this is, there a many more benefits of TOGAF that exceed this, making you more valuable to your business and the rest of your team. Plus, there are industry-wide factors that are fantastic motivation to get TOGAF certified. Below is a breakdown of the five best reasons you should invest in your skills, aiming for the pinnacle of enterprise architecture, TOGAF certification. 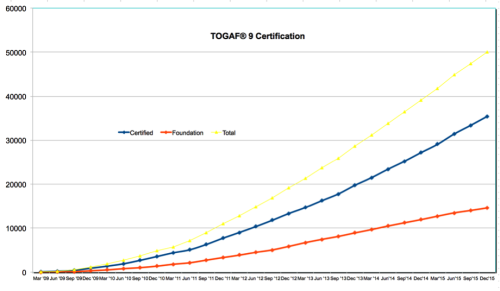 One huge reason to get your TOGAF certification is because the demand for enterprise architects is soaring. The UK is the global leader in TOGAF certified professionals, accounting for around 16% of all TOGAF certifications worldwide. From 2013 to 2014, the number of newly certified TOGAF professionals increased by around 11,000 (around 45%). These figures give you a sense of the rate at which the certification is growing as well as its popularity in the UK. The momentum TOGAF currently has, is down to the demand for more TOGAF certified professionals. One cause of the rise in demand, is that more people in IT and other sectors are realising the long term importance of enterprise architecture and its certifications. As IT technology and architecture advances and becomes more prominent in all parts of business, it’s becoming equally important to plan how your business’s enterprise architecture will be managed in the short and long term. If you don’t do this, businesses face the risk of their technology and architecture becoming obsolete. This is why businesses are looking for more TOGAF certified professionals, and why you should look to get certified and take advantage of the growing demand. TOGAF certified professionals share a common language and a common knowledge of expertise. This is a fantastic skill to possess. As it’s unique to enterprise architecture professionals, it’s a great asset to help fuel the development of IT and enterprise architecture. This language and its skills also have the potential to improve your management skills. A main aim of TOGAF is to show you how to better identify the needs of your business. Once you learn the language of enterprise architecture, you’ll be much better placed to guide your team, and the business as a whole to meeting these needs, making you a better manager. Another principal aim of TOGAF is to teach you how to meet the demands of your organisation most effectively. This means identifying how the IT budget is being spent and then finding areas where the budget could be spent more effectively. On top of this, TOGAF aims to teach you how and where teams have the potential to fit together better. Combined, these skills make the running of your business far more fluid. This is an area where a TOGAF certification can make a big difference. Learning how all the different parts of the business fit together, gives you the ability to spot how these processes can be streamlined. This reduces costs and friction, making departments and the business as a whole, more efficient. TOGAF can give you the ability to take on the role as the simplifier in your business and is a great way to impress managers and directors as its insight hard to come by. We’ve already mentioned that the skills you’ll learn from the TOGAF certification are valuable and unique. On top of this, as TOGAF is a globally recognised certification, it brings a high level of trust from your customers, employees and colleagues. This helps reduce friction in the management of enterprise architecture. Getting certified increases your reputation, demonstrating you have proven, elite level skills. Building upon the previous point, getting certified can increase your worth to businesses. This could mean a potential pay rise after achieving your certification. 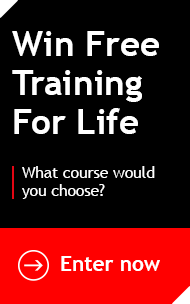 As a whole, getting TOGAF certified is a fantastic investment in your skills and your future. According to itjobswatch.com, someone who is TOGAF 9.1 certified commands an average salary of £67,500. Also, because of its growth in demand, more industries are realising the importance of enterprise architecture, meaning TOGAF is becoming increasingly versatile and applicable to a variety of job roles. A final reason why TOGAF is a solid investment in your skills, is due to its position at the top of the enterprise architecture field. This means once you’re certified, there is no great need for further enterprise architecture certification, increasing the longevity of your investment and the value of your certification. TOGAF is one of the most popular enterprise architecture certifications that many EA professionals should be aiming for. This is due to its versatility, longevity and return on investment in many areas. It’s growing in demand, is applicable to many different industries and job roles. It can improve fluidity and efficiency in the running of many business areas, as well as providing you with great career prospects. Make sure that the certification is right for you and your area of business, but if you think it is applicable and you’d benefit from enterprise architecture skills, TOGAF is an excellent certification for you.